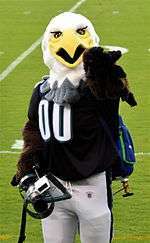 The mascot Swoop is used to represent various sports organizations in the United States. One of the most notable mascots named Swoop is used by the NFL Football team the Philadelphia Eagles. Various American universities use the name Swoop as their athletic program mascots. Swoop made a cameo appearance in an NFL Shop commercial where a thief disguised as a kangaroo mascot tried to steal Philadelphia Eagles jerseys from the locker room after a game. Swoop walks into the locker room and the kangaroo tries to escape but the security guards catch it. Swoop also made a cameo appearance in the 1994 comedy film Ace Ventura: Pet Detective, where Ventura beats the mascot after the latter shooed away an albino pigeon (which was worth a lot of money that Ventura wanted). The "Swoop" character is depicted as an American bald eagle wearing a sports jersey of the Philadelphia Eagles. ↑ "Philadelphia Eagles Mascot". Philadelphia Eagles Mascot. Philadelphia Eagles. Retrieved 3 March 2013.